The Rural Technology Action Group has completed over 55 projects since its establishment in IIT Madras in 2004. 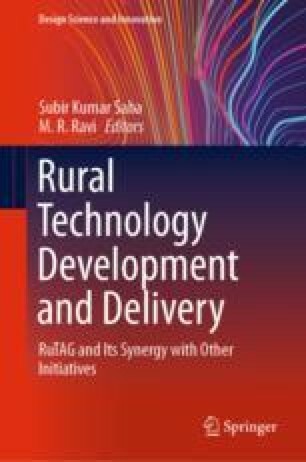 This paper reviews six of the most impactful activities in the sectors of livelihood generation and productivity improvement by drudgery reduction. A new process was developed to produce glazed microwaveable pottery using common red burning clays. A manual climber was designed to improve ease and safety of climbing palm trees for untrained people, while a household oil expeller was developed to enable production of cold pressed oil. An automatic potter’s wheel and a coir ratt were developed, both with varying speeds to mechanize operations of wheel rotation and rope-making respectively. A dual drive charkha was developed to enable the operator to switch hand and foot drives at will and thus improve productivity. RuTAG, IIT Madras is thankful to the Office of Principal Scientific Adviser to the Government of India for its continued support of initiatives. RuTAG, IITM is grateful to the project investigators of the projects reviewed in this paper—Dr. T. K. Mukhopadhyay from CSIR, Central Glass and Ceramic Research Institute, Kolkata, Prof. Shankar Krishnapillai and Prof. V. Kalyanaraman from Indian Institute of Technology Madras, Chennai, Dr. D. Rajalakshmi from Kumaraguru College of Technology, Coimbatore and Dr. S. Ganesan, RuTAG, IITM—for their dedicated technical expertise. The efforts of all the project associates, assistants and students involved in the projects are acknowledged gratefully. The author is thankful to Prof. Abhijit P Deshpande, Professor-in-Charge, RuTAG, IITM for his guidance.